Dear Santa, "I want it ALL!" No, not really, but how often does it seem our students and own kiddos (if we are being honest) want ANYTHING and EVERYTHING for Christmas. 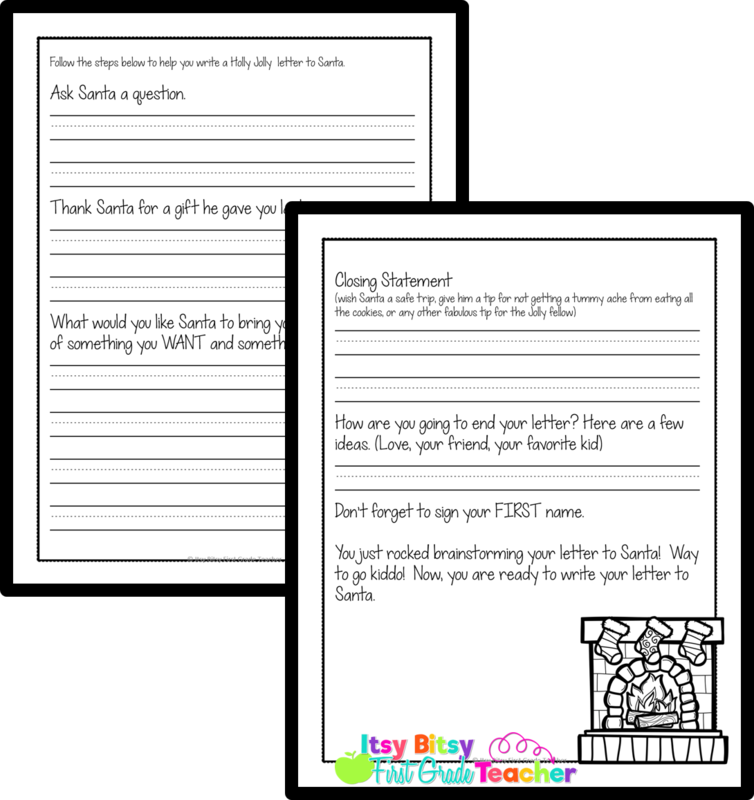 Every year come December, our students write a letter to Santa (religious beliefs and parents permitting). The letters are sent to our local newspaper and printed. This is a great way for our students to practice another writing skill, but let me be honest for a second... it can be STRESSFUL! It was one of those times that I absolutely DREADED teaching writing (not to mention it took FOR-EVER). Below is what I do in my own classroom that made writing letters to Santa fun and stressfree. One of the first steps is to create a "wish list" as a class using an anchor chart. Now, I'm not sure about your class but when I would have them brainstorm independently I would have several things happen. First, their lists went on, and on and on for which seemed like an eternity. Next, some didn't know what to write or would get bogged down in not knowing how to spell. Oh, and I can't forget the dreaded phrase, "I can't find my paper!!" Yep, happens at least once, EVERY...TIME! When the brainstorming stage is brought to the carpet it allows us to come up with great ideas together. We stretch out sounds, listen for "chunks" we know, point out how we have to capitalize names of toys and many other skills we might quickly cover as a teaching moment happens. After we brainstorm what we might "want" for Christmas, we move to filling in our graphic organizer. This is done the day after we brainstorm. Too many steps + too quickly = frustration for all. I came up with the organizer after being frustrated by the process and what I read in their letters. Now, let me be very honest with you... It wasn't any one's fault but my own. I needed a clearer way for my students to SEE what I wanted them to include. My students knew the parts of a letter, but that truly wasn't enough. I needed to slow down, back up a bit and dig deeper into teaching what their letter should include. I knew I wanted them to begin the letter by asking Santa a question and not with the statement, "I want." Next, they needed to thank him for something they received the year before. After they completed both of those sentences they could begin telling Santa what they wanted. I also wanted them to include something they NEEDED. It is a great time to throw in a mini-lesson differentiating needs and wants. 😉 I will tell you that including something they need can be enlightening to circumstances they face at home and heartbreaking. I like to pull up the organizer on my Smart Board and read each question as a class. They fill in their answers as we go. I also stress answering the questions in a COMPLETE SENTENCE. If they will write in complete sentences on their organizer it SAVES TIME when they write their letter. Once their organizers are complete we can move to the final step. Can I get a Yipee?!! Now that the organizer is finished, they take what they have written and add it to the letter writing paper. The order of the organizer is the same order they will write their letter. This helped to save time in figuring out what order they would write their sentences. An extra tidbit that I almost forgot....I like to write one as a class before handing them the reigns to complete their own. This helps them to visually see what they will do. Not to mention, some want to begin a new line for every new sentence. Writing one together allows me to include a mini-lesson on when we write letters our sentences don't need to start on a new line every time. 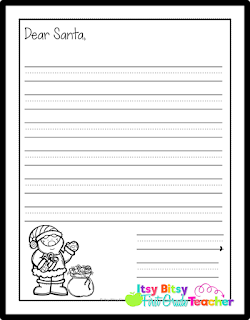 I hope this template saves you time, energy and some of your 😉sanity when you write Santa letters. To download your own free copy click HERE. I would love to know what you find frustrating when teaching writing. You can add to the comments below. Happy Friday! How are you? Is your summer break over yet? I go back to work on Monday. The summer flew by! I will be living up at the school most of the weekend to get my classroom ready. This week we are tackling Goals 9 and 10. This particular goal is important because readers need to understand not only what the text is mostly about but they need to identify which facts correlate with the main idea. Below are a few of my favorite strategies from this goal. 9.2 Reading with a Sense of "Wow"
"When you read with curiosity and interest, you're more likely to learn and remember the new information you encounter." (pg 251) We want readers to listen with "wonder" and to think about facts they might not have known before reading the text. This strategy would be great to introduce to the whole group (especially when first reading nonfiction text with first graders). It is teaching students to read informational text knowing they will learn something. It is easier to sit back and listen to a text for enjoyment but much hard to listen knowing you need to pull out important information. I have had students who tried to zone when listening to a topic that they "think" they know all the facts there is to know about the subject. I believe that this strategy would help students to expect to learn new information and to approach an informational text with the excitement of what they can learn. I really liked the twist on this goal from the traditional KWL chart. In this goal, students "jot" what they know for sure, what they think they know and what they wonder. I LOVE how it has students discussing what they are wondering about the given topic. In this strategy, students read part of a book (or the whole book if it is short) and recall what they have read. How often do students read a book and then they can't recall what they read? I like how this strategy has students stop often and reflect what they are learning. They are thinking about the facts they have learned to see if they understand what they are reading. Text features are a big part of reading, navigating, and understanding nonfiction text. I like how the author talks about how as teachers we need to do more than help students identify the text features. As we introduce the text features, we need to help students use them to get more information from the text. This goal would be a fun way for students to remember the facts in a book. It teaches students to reread to add more details. I like how it is teaching students to sketch what they remember in chunks. They read, sketch, reread, add more details and reread again. It allows students to visually see how when we reread information we can learn something new each time. When you are reading a text, how often do you "skim" the pictures? I LOVE how this is helping students to gather more information from the pictures the author is providing. Students look at the picture, read the text and decide, "What in the picture is the same as what's in the words? What's new?" (pg 278) Then, students say the extra facts out loud. It allows them to think about what they have learned from the picture that is not in the words. This strategy has students use text looking at bold words to reflect if they know what they word means. It has them checking to see if they can figure out what the word means based on how it is used in the sentence. If they can't, they flip to the glossary to learn the meaning. This is giving them the skills they need to use different text features to help them learn the meaning of important words. Thanks for joining me this week! What was your favorite strategy this week? Hey, guys! Happy Friday! How was your week? This week we are reviewing goals 5 and 6. When I read the titles of the Goals, I thought, "Oh, good! I LOVE teaching comprehension" (Not to mention I like to incorporate high-yield strategies to help my students practice comprehension. I will share some of my favorites in future blog posts😉). Now, before I share some of my favorite goals from this week I want to let you in on a little secret. It is a time that I want to #getreal with ya' for a minute. In the past when I thought about teaching plot to first graders it made me feel like I was heading for a downward spiral (not knowing where I would land). There are SO many components, and it seemed #overwhelming on how can I make it understandable for my firsties. Can you relate? Maybe you have another #overwhelming feeling when teaching another strategy. If you do, and feel lead to share, feel free to do so in the comments. If there is a way I can help you overcome that feeling, I would LOVE to help! 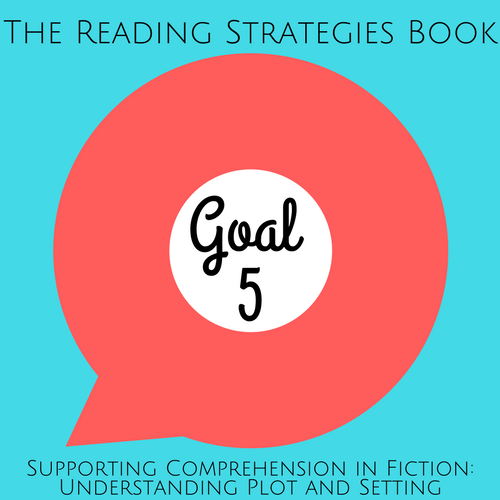 After reading Goal 5, I do think I am better prepared to dive deeper into teaching plot. Now, I get to share with you a few of my favorite strategies from Goal 5. Why is this goal important? When students' read, they need to understand what is happening in the story. I like how she used the term, "make a movie in their minds." (pg 130) What kid doesn't like to watch movies, cartoons and share about their favorite! For this to happen, students need to know what's going on, who is involved, and where the action is taking place. I loved how she broke down the different parts of a plot. It made sense and helped me see that the #scaryterm #plot was just that, a term that I thought was scary, but one that I had been teaching my students (without using the term plot). Students may need help in understanding the plot and setting in a story. This has several different parts. If a student understands the problem and solution in a story, it will help them decide what is important. Retelling/Summarizing. Serravallo mentioned that these terms are often confused and used interchangeably. I like how both terms were described. Think of retelling as an oral summary of a text using story elements. It should be sequential and will have more details than a summary. Summaries give important information without the use of much detail. When students visualize the setting, it allows them to see how to impacts the events and also see when the setting changes. Synthesizing cause and effect helps the reader know what causes certain events and how they are connected to the story. This is such a simple strategy that can be used early on in a students' reading. With this strategy, you read the title and tell students to keep the title in mind as they read. The goal is for them to think about the events in the story that connects back to the title. It would be a great stepping stone to get students to begin thinking how the title relates to the problem in the story. I can see this being used during a read aloud. The teacher can write the title on chart paper and then use interactive writing time to reflect on the problem that relates to the title. I have to say this might have been one of my favorite strategies that are suitable for first grade. The language used in the prompts is kid friendly, and catchy so I see it being one that is easy for them to remember. It works like this....when students' retell the story they need to think about the problem (uh-oh), how it gets worse (UH-OH!) and how it gets solved (phew). Using the story mountain with the retell allows students to retell the story while touching the parts of the mountain as they retell. This strategy has students thinking about the problem using fewer words than retelling the whole story. I do believe that it will take practice with first graders. Most of the time, they either want to tell every detail they can think of or it is like pulling teeth trying to get them to say much of anything. If we can work on this type of summarizing at an earlier grade level, I do believe it will help when they have to do it on standardized tests. 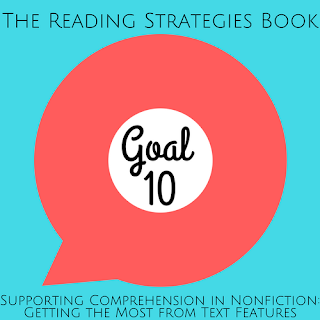 This is a great goal to practice for students who are reading chapter books. When students find a series they like, it allows them to think about the different problems the characters might face and how they will solve the problem. One of my favorite short chapter books I read aloud to my students is Roscoe Riley Rules. My students love all of the books in the series. If you have never read one, Roscoe is ALWAYS getting himself into a predicament. Roscoe tells his story from his "time-out" chair. So, we know it is a guarantee Roscoe will get in trouble at some point in time in the book and will end up in time-out. The prompts included in this goal is perfect for several different chapter books. A few books that I think would work well is Magic Tree House, Junie B. Jones, Cam Jansen, and Zoey & Sassafrass (one I hope to add to my collection this summer). Characters develop during a story. It is also connected to plot development. When reading, we want our students to pay attention to the details the author is sharing about the characters. This will help to discover who they are. Students' must be able to use inferencing skills to help with this discovery. One of my favorite parts of this goal can be found on page 164 when she broke down what a student should be able to do based on their reading level. #helptakeguessworkout of character development. I am sharing a few of the levels below but left off past level N.
Level E-J: characters tend to be simple. At this level, students should be able to describe the character using simple language like, "he is sad," "he likes to play outside." Level J/K: character feelings might change. So, the character might be sad in the beginning but by the end of the story is happy because of an event that happened. Level N+: characters become multidimensional. This shows how a character can have more than one side, depending on the setting of the story. 6.2 What's in the Bubble? This is such a fun goal and will be easy to adjust depending on the reading level of your group. It allows students to begin thinking what the character is thinking (even when the words on the page don't tell us). I love how she suggests using sticky notes to flag pages to help hold their thinking. The use of speech bubbles on sticks is an easy way to have students pause and talk about what the character might be thinking. Upper levels can write in the bubbles. This goal would be easy to incorporate independently and with a partner. How much fun do you think this would be to incorporate in your classroom? I think my students would love making a face to fit an emotion for a poster. Almost every year I have at least one student who struggles with showing (or knowing) their feelings. This activity would be a great visual connection. It would allow them to point to an emotion that matches the character AND can make the same face themselves. This is such a fun way for students to get to know characters in a story better. I can see it being an extension activity. (I would probably want them to read the story for 2 days before tackling this activity independently), When students are ready, they could work in pairs during a literacy station to choose a scene and act it out. They would LOVE this. Depending on their reading level you could even have them write out a simple script of what they want to say during the scene. If you have the technology available, another student could record their scene using an iPad. My students LOVE activities where they can be creative and share with their classmates. Well, that is a few of my favorite strategies for this week. What was your favorite takeaway? Is there a goal that seems overwhelming? Feel free to share! I can't wait to read your thoughts for the week. Hey, guys! How was your week? I hope it has been incredible. We have had a week full of a birthday party, swimming, cooking out on the grill, card games and so much more! This week we are diving into Goals 3 and 4. I hope you enjoyed reading the goals as much as me. When I first began reading this chapter, the first sentence really stuck out. It was one that had me reflecting (again). "In order to construct accurate meaning from a text, children need to read words correctly, integrating three sources of information: meaning, syntax, and visual." (pg 76) WOW! That is a lot of balls for a student learning to read to juggle. Naturally, it would be difficult for them to use all 3 concepts correctly all the time when learning to read. As teachers, we have an incredible opportunity to give them the tools/strategies they need to use all three when reading. Running records is the best tool we have as teachers to know. There is a wealth of knowledge we learn about where a student is, in the reading process when we look at their running records. What type of mistakes are they making? Do they go back and re-read when it doesn't sound like a book? Are they missing the vowel sound, changing the beginning, middle or end of a word? Do they substitute a word for one they know (but it still might make sense in the story)? I always learn so much when I evaluate what they are doing while they are reading. What do you use for running records? Our district currently uses F&P for the beginning, middle and end of the year. The rest of the time, my running records come from books in our literacy closet or Learning A-Z readers. Now for the good stuff! I want to share with you a few of my favorite strategies from this goal. 3.4 Does That Sound Like a Book? This strategy is suitable for any level and any type of text. It is also a strategy that I have often used in my guided reading time (aka..one of my favorite times of the day 😉). I really like how she changed the language in this strategy. Up to this point, there were times I had said, "Does that make sense?" In doing so, I did not realize how this might affect my ELL's. I like how she explained that the words they read have to sound like a book. In making a simple change such as this, it could really help some of my students. I like how she explains that looking at the first few letters of a word you are getting a "running" start and what kid doesn't like to get a head start! 😉 "...when children slow down to approach an unknown word, they drop the meaning from the entire beginning of the sentence and just start puzzling over the word." (pg 93) Yes! Yes! Yes! I couldn't agree more. Something to keep in mind when using this strategy is when a word has a digraph. We want them to see the digraph as one sound. The same can be said for blends. If it is a muli-syllable word, we want to give them the tools they need to break it apart and use the strategy for each syllable. I can't wait to try out this strategy during the school year with my students using the prompts she provided. I love using this strategy in my guided reading groups. I have found it really helps some of my babies not feeling overwhelmed when reading a word that "looks" like it might be difficult. Sometimes my students come to an unknown word and stop altogether. They try the "I don't know that word" even before attempting to break it apart. When I first use this strategy with my students, I show them how to cover up part of the word as they are reading and we break it apart then put it back together. After awhile, I see my students applying this strategy when they are independently reading. I love, love, love how she explained what type of fluency is acceptable at specific reading levels. It was also exciting to see that she is not a fan of the dreaded stop watch being used to determine fluency. I always have students who get nervous when the stop watch is pulled out to "time" their reading. Using a blank piece of paper for a running record, we can add a slash to show how many words a student read in a phrase. This strategy is teaching kids to read a few words at a time instead of reading word by word. One thing I like to do with this strategy is to pull up the Go Noodle song, Don't Read Like a Robot. They LOVE this song, and it would be an excellent introduction to this strategy. Do you have your students read with a partner during your literacy block? My students LOVE reading with their buddy. I like how it is teaching students to not only listen to themselves reading but also their partner. It would help cut down on the times the partner is spending more time looking at what is happening around them instead of being a buddy when reading. Focusing on the phrase you want them to repeat to their partner will help give them the tools they need to help one another read. The active listening rate would definitely increase using this strategy. This strategy is a quick practice for students to read phrases that show up in books. This will help them practice reading phrases in books. One way I incorporate this in our Literacy Block is in our "Fluency" Station. This station has leveled sets of phrases for students to practice reading. They also choose what type of voice they want to read the phrases in. They take turns reading the phrases with a partner and a minute timer. The timer helps them take turns quickly without arguing. They LOVE this station and frequently hear giggles. Well, that is a few of my favorites from this week's goals. Do you have a goal that stuck out to you this week? Is there a strategy that you would love to try out this next school year? I would LOVE to hear your thoughts below. See you next week with Goals 5 and 6. Well, enough about me and wanting to hit the pause button. 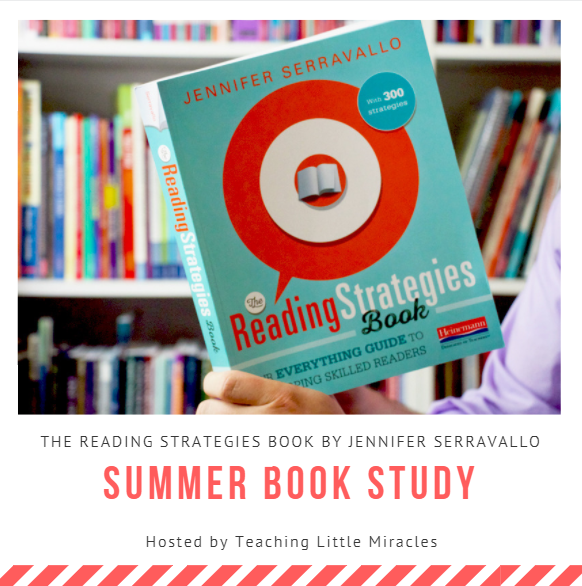 I hope you are enjoying the book study. I am excited to begin learning the different strategies Jennifer has shared in the book. Can I just say that I LOVE the layout? It makes grasping the strategies with ease. It will be a great tool during the year to open it up and plan lessons to meet the needs of my students with ease. Now, for the good stuff! This week we will be reviewing Goals 1 and 2. I am excited to jump into the "meat" of the book with all of you. A quote from the book that stuck out to me right off the bat was, "when you refer to the book as a story, it really is a narrative- by taking care with you language choices you are teaching your students important lessons about a genre." (pg 22) Wow! I had to self-reflect with this quote. How many times did I refer a book as a story not realizing it might cause confusion later? Using appropriate language is key, beginning early in their reading development. I know how important common vocabulary is in a child's learning, why had I not thought about it in this setting as well? Text that includes visually engaging pictures. Stories that have a strong narrative with some repetition. Informational text where they can learn content from the pictures in the book. List book with supportive pictures. Alphabet and number books that help reinforce what students know. Now, on to share a few strategies from Goal 1. This strategy is best used with narrative text. It allows students to practice storytelling and sequencing. I really liked how this strategy talks about how every page in the book connects to make the story. It is looking at one page in the books picture to say what happened and then turning the page to see what happens next. I have noticed in a small group (and whole group reading) there are times that students do not make the connections that the pictures connect. Together, they tell the story. One of my favorite prompt examples that she listed was asking, "so what happens next"? This thinking stem allows students to be thinking beyond what they see on the page and moves them to think about what could happen next before turning the page. This just might be my favorite strategy from Goal 1. I LOVE adding movement to my classroom any chance I can. As I was reading this strategy I thought of reading the book, The Old Lady Who Wasn't Afraid of Anything. Have you read it? If not, it is a perfect read for October! My students always LOVE listening to this story. We add movements as I am reading to match the clothes that are following the little old lady. There are always many giggles! One thing is for sure, they do not have difficulty remembering. This is a strategy that would be easy to incorporate and one that I will be using more frequently this next school year. It would be perfect for a review in a small group when they are reading a story for the 2nd day/time. I like how this is teaching kids that reading is thinking. We want kids to think beyond the text. They need to read the words on the page but also need to say what they are thinking in their mind (when they are reading). They are having to use clues from the page + their background knowledge to decide what "maybe" happening. There have been times where a student read beautifully but could not recall anything they just read. This is a strategy that I use during some of my read aloud. I will include more specific thinking stems she mentioned this next school year. I like the verbiage she used and how she also encouraged student responses. "without engagement, we've got nothing" (pg 44) YES!! This piece is key to student success in reading. At the beginning of the year one of the first strategies I teach my kiddo's is building stamina. We have to have this piece down before moving forward or the rest of the year will be extremely difficult and not near as productive during our Literacy Stations. When I first introduce reading to self to my students, we talk about finding the perfect place to read around the room. It is teaching students to be mindful where they work best. In our classroom we use flexible seating so early on they are discovery where they learn best, finding a perfect reading spot is just an extension. I truly believe students should be given the opportunity to discover where their "perfect" spot is. I like how she has students pick spots based on previous success and has them try a different spot. Allowing them to reflect on what worked, what might not work and where they would like to try in the future. I love to use goal setting with my first graders. It is something that can be used across all subject areas, allows students to self-reflect and makes changes as needed. I also find it equally important that students are able to see the growth they are making to meet their goals. The "party" ladder gives students short-term goals to meet the larger goal at hand. After a period of time, the ladder can be modified to meet a new challenge. How often do we have reluctant readers? They see ALL the words on a page or how THICK the book is and say... NO WAY, I can't do that! I love how this visual breaks down their reading and gives them time to reflect over a SHORT period of time. How many times have you heard a student say... "I don't like this book. I don't want to read it." I can't even begin to tell you how often I had heard these words, even before they opened the book to give it a try. Then, there are other times where they don't have a choice (ex: testing). It is something they have to read. This strategy is beneficial for students who are at least on an "E "reading level. I appreciate how she approaches this strategy by teaching students when they say something isn't for them it is like a light switch that turns their brain off before they even begin. Having students try and change their mindset will help them in the reading process. Teaching them that attitude when reading can change how much we understand and able to focus. For me, this was a HELLO, LIGHTBULB moment! I want to be able to give my students the tools they need to get over the #idontlikethisbook, #itisntforme moments. Well, that is a few of my favorite strategies from this book so far. What are your thoughts? Do you have a favorite strategy for Goal 1 and/or 2? If so, feel free to share it below. Thanks for stopping by. I look forward to sharing next weeks goals with you.